The international classical music magazine Fanfare recently wrote, “The Romantic spirit lives, breathes and flourishes in Kermit Poling,” remarking on his “quite natural musicianship.” Indeed, Kermit Poling is an inspiring and passionate voice in American music—a musician whose talents encompass conducting and composition along with years of virtuoso violin performances. Forum Magazine named him one of the top 10 people to watch. After 32 seasons as the Shreveport Symphony’s Associate Conductor, 27 years as Concertmaster, and his many seasons as music director of the South Arkansas Symphony, the Marshall Symphony Orchestra and the Shreveport Metropolitan Ballet, few audiences in the Ark-La-Tex are unaware of his many talents. As a conductor, Maestro Poling performs extensively throughout the world. In January 2017, he made his debut recording with the London Symphony Orchestra, recording an album of his own compositions for the Centaur label. He has been featured with European orchestras such as the Orchestra Filarmonia Veneta in Italy, in Mexico with the Symphony Orchestra of the State of Mexico and the Shenzhen Symphony of China among many others. Closer to home, he’s conducted the Oklahoma City Philharmonic, the Longview Symphony, Monroe Symphony, the Shreveport Summer Music Festival and other U.S. orchestras. Poling’s compositions have excited audiences everywhere. His Symphony No. 1 (“Shreveport Symphony”) was premiered by the SSO and Michael Butterman in 2016 and his Guitar Concerto “Concierto de Chiaro” received a rave premiere later that season by the Shreveport Summer Music Festival and guitarist Giovanni De Chiaro. His quartet, Within the Orb of Glories Wearing, received its international television debut in February 2017 on the EWTN cable network. His ballet Snow White, originally composed for Shreveport Metropolitan Ballet, premiered in a new production by the Pennsylvania Ballet in Philadelphia. The Pennsylvania Ballet will perform a new ballet, Prince Charming, in the spring of 2018 and the Des Moines Ballet has commissioned The Little Mermaid for a premiere in 2019. Other recent compositions include the ballet Peter Pan, premiered by the University of Hartford in 2014, and Beauty and the Beast, premiered by Ballet Oklahoma in 2014. His work No Sound of Trumpet nor Roll of Drum was premiered in 2011 marking the 150th anniversary of the start of the Civil War. His score to the silent film Tarzan of the Apes and for the documentary Tarzan: Lord of the Louisiana Jungle won accolades across the country. Poling received the Outstanding Artist in Music Fellowship in 2000 from the State of Louisiana and twice received a Music Fellowship from the Shreveport Regional Arts Council. Maestro Poling studied at the Boston Conservatory of Music, the Cleveland Institute of Music and the Tanglewood Music Center, where he worked with Leonard Bernstein, Kurt Masur, Gustav Meier and Seiji Ozawa. In 2012, he was awarded a career advancement award from the State of Louisiana. Kermit Poling has been a featured conductor on NPR’s Performance Today, the Arkansas Educational Television Network, the Red River Radio Network, WGBH Boston and has appeared as violinist on Louisiana Public Television and PBS in addition to numerous television and radio stations throughout the country. 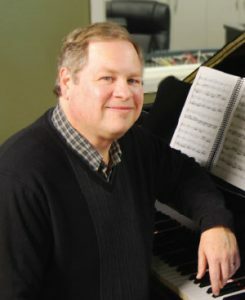 He has served on the faculty of Centenary College, Texarkana Community College, the Boston Conservatory and the Puerto Rico Conservatory of Music. Away from the concert stage, he is choirmaster and organist at St. George’s Episcopal Church in Bossier City, LA, and is the General Manager and well-known classical music voice of Red River Radio (KDAQ Public Radio).